Jacob Handl (1550–1591) was a Slovenian composer who resided in Austria and Bohemia. He stayed at the Benedictine abbey at Melk and went on to Vienna in or around 1568. By 1574 he is known to have become a singer at Maximilian II’s imperial chapel. From 1575 he spent the next four or five years travelling and learning and was then engaged as a musician by the Bishop of Olomouc before moving to become Kantor of Saint Jan na Brzehu in Prague. Handl was clearly a master contrapuntalist, although his music suffered some criticism in its day on account of its complexity. 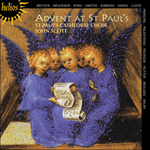 The anthem Ecce concipies is a setting of words from the first chapter of the Gospel according to Saint Luke. The text, which forms the Gospel reading for the Feast of the Annunciation of the Blessed Virgin Mary, proclaims that Mary will conceive and bear a son. In the secunda pars of this anthem, the tempo changes to triple time, boldly to announce that Jesus ‘will sit on David’s throne, and rule his kingdom’. et vocabis nomen eius Jesum.